Vermont American taps and dies are tooled to the most exacting specifications to ensure that bolts fit tightly and anchor securely. Taps are rust and tarnish resistant for greater durability and more accurate fitting. Taper Taps – 8 to 10 threads chamfered for easy starting of thread in tough materials. Bottoming Taps – 1-1/2 threads chamfered for use where thread must go to bottom of hole. 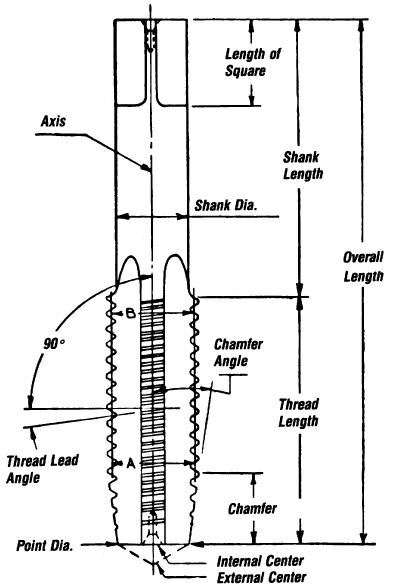 Example: A 1/4-20NC tap has a nominal major thread diameter of 1/4″, cuts 20 threads per inch and has a National Course thread series.